Behavioral Merchandising Performance reporting shows a number of KPIs for orders, visits, bounces and conversions for different Campaigns plus a range of other reports over a selected period (‘Today’, ’Yesterday’, ’Last 7 days’, ’This Month’ and ‘Last Month’). 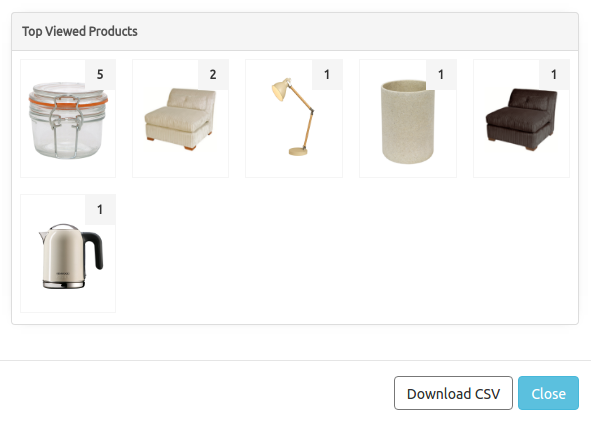 Top Viewed Products– The top viewed products by a Segment over the selected period. Top Bought Products– The top viewed products by a Segment over the selected period. Top Viewed Categories– The top viewed categories by a Segment over the selected period. Top Bought Categories– The top bought categories products by a Segment over the selected period. Top Viewed Brands– The top viewed brands by a Segment over the selected period. Top Bought Brands– The top bought brands products by a Segment over the selected period. Total Visits– The total visits over the selected period. Total Unique Visits– The total unique visits over the selected period. Total New Visits– The total new visits over the selected period. Total Returning Visits– The total returning visits over the selected period. Total Number of Purchases– The total number of purchases over the selected period. Total Value of Purchases– The total value of purchases over the selected period. Average Order Value– The average order value over the selected period. Total Number of Abandoned Baskets– The total number of abandoned baskets by a Segment over the selected period. Best Performing BMZs– The best performing BMZs over the selected period. Best Performing Campaigns– The best performing Campaigns over the selected period. As well as filtering by segment you can filter by Channel. N.B - The Offline Channel is for any over the counter / telephone orders that cannot be tracked online. They are sent automatically from the PureClarity plugins. Any custom integration can send offline orders over using our API. You can download a CSV file for an individual report by clicking on ‘view more’ at the bottom of the report panel. You can then click on ‘Download CSV’.